It seems we’ve been using Genesis Mining’s cloud mining services for two weeks already and have decided to do a short update on our experience with the service after our initial impressions form the service that we’ve shared earlier this month. 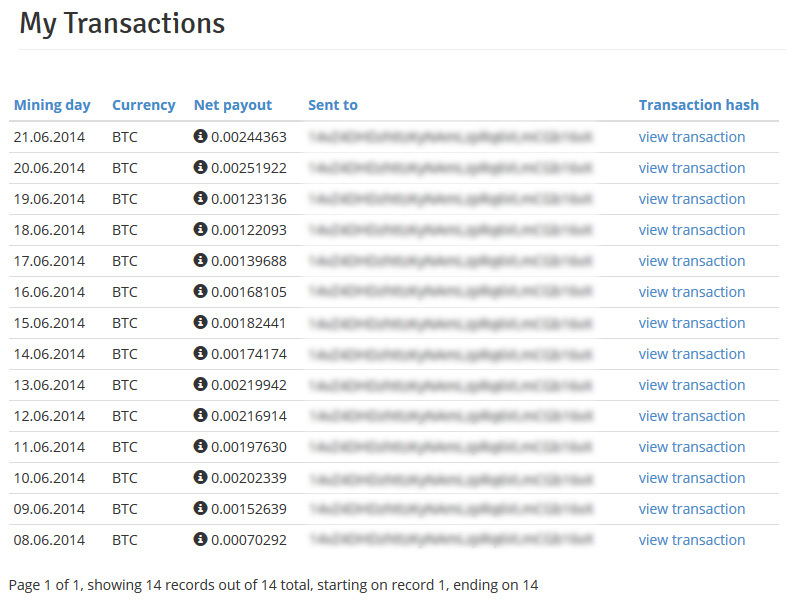 You can see the list of transactions and payments we have received so far with 1 MHS worth of Scrypt hashrate at the service and the full hashrate set to BTC payments, so whatever the service has mined gets converted to Bitcoins and we get payed in BTC at the end of the day. 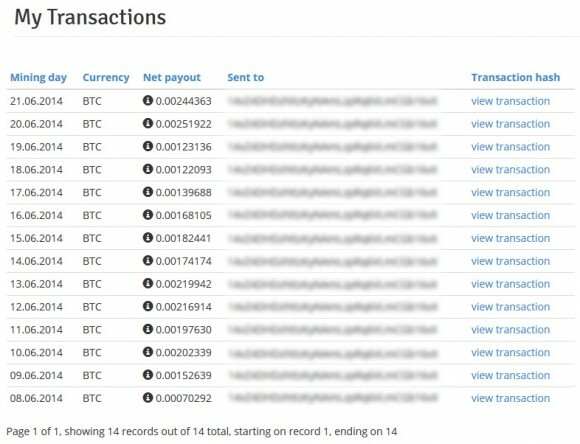 As you can see from the numbers there are some days with better results than others, but you can get a good idea on what to expect as an average and be able to do the math multiplying the numbers for more megahashes if you are interested. On a side note, the service as also started accepting DOGEcoin as a payment method for hashrate, though if you convert the 1 MHS price of $180 USD to DOGE the amount you get is quite big – 561909 DOGE (over half a million). And of course you already have the option to allocate the cloud mining hashrate that you purchase for mining DOGE in the control panel should you be interested in that. Initially the prices that Genesis Mining had for the Scrypt cloud mining hashrate were quite good, but with the latest price drops of the Scrypt ASIC miners you could be able to purchase Zeus-based ASIC miners for half the price for the same cloud mining hashrate. So this is something to consider as well when thinking about the possibility to go for the easier way of cloud mining, where you will not have to deal with actual hardware installation and management, including power usage, heat and noise generated by actual Scrypt ASIC miners. You can also use the following up to date promo code to get a 2.5% discount of the regular price nSO2TE should you decide to try out the service yourself.